Did you know that August is Family Fun Month? It's the perfect time to enjoy time outdoors as a family. Enjoy a picnic, make s'mores, sit around a campfire and tell stories, and enjoy other outdoor activities with your family. And, you needn't worry about heading indoors at the first inkling of darkness-- the LumaGlo Crossbelt provides 360° wearable illumination for the ultimate in low- or no-light visibility. We've had a LumaGlo Crossbelt for a couple weeks now and have already used it several times, with Logan having used it the most. Logan is a runner and goes on runs daily, both in the day and at night. He's been wearing the LumaGlo Crossbelt around his waist at night and he feels safer knowing that he can be seen. Drivers and other impediments can clearly see Logan when he's running at night, and the chances of someone running into him are a lot less slimmer. The LumaGlo Crossbelt has extremely bright, multi-colored LEDs function in eight distinct patterns and provide intense illumination that distinguishes the wearer from background lights. It is available in two sizes, and can be worn as a belt or a sash. LumaGlo Crossbelt needs to be charged before first initial use, and will need to be charged each time it no longer has full power. One charge lasts for 3-6 hours. 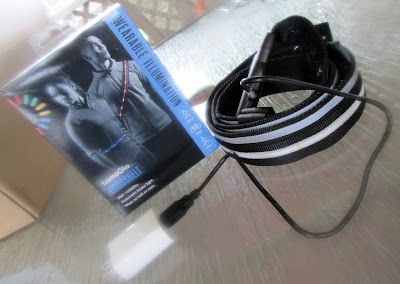 A micro USB cable is included but you may need to have an adapter to plug the cable into an electrical outlet. 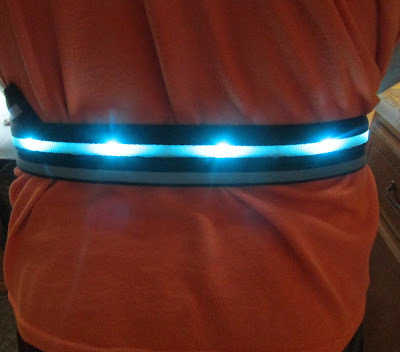 There's a button on the belt that powers the product on and off, and it's also what you need to push to cycle through the desired light pattern. A brake light feature automatically causes the LEDs to flash bright red when you slow down to stop. An emergency feature causes all the LEDs to strobe bright red. The multi-colored, moving patterns are what's seen when the person wearing it is in motion. The LumaGlo Crossbelt makes me think of a seatbelt with futuristic lights. Like I mentioned earlier, there are two sizes available. I'm bigger than Logan so the one we have fits me better than him. Although the smaller size would suit him best, he can still wear the one we have because it can be adjusted it to fit nicely around your waist or around your chest area. The LumaGlo Crossbelt became available for purchase just this month. Go and get yours now! 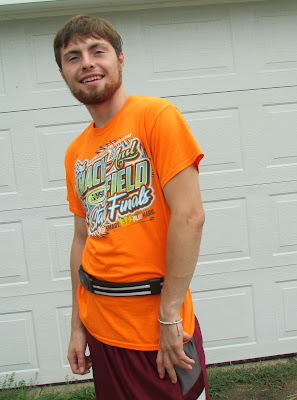 In what situations would you wear a LumaGlo Crossbelt? this is essential for any activity that requires being on a road. You'd be surprised how hard it is to see people, especially on bikes, when it's dark. This is neat. It would be great for walking at night, sometimes it's so hard to see people.